This commission for Benjamin Sullivan celebrates the RAF Club’s 100th Anniversary. He has been working on it since February 2018. The portrait includes a number of personal links between Benjamin and this commission. If you look in the background you will see a Spitfire – ‘S’ for ‘Strike’ – from 253 Squadron from which the artist’s grandfather, F/Lt JM Sullivan, flew over Albania during WW2. The image on the right is a portion of ‘Hurricanes in Flight‘ (1944), by Eric Ravilous, painted as part of his work for the War Artists’ Advisory Committee. Ravillious was an artist who lived and worked in the area in which Benjamin now lives. ‘It was almost happenstance that it was placed there but it gives some idea there’s actually a person as well as a figurehead – it’s personal.’ He said. 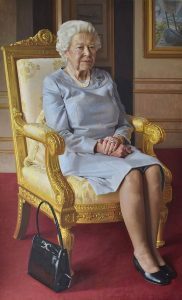 The Queen has been Patron of the Club since 1952 opened its new wing as well as to unveil the painting. More about Benjamin Sullivan who has just won the BP Portrait Award.